Under-ride is the term given to forklift accidents that occur when a standing operator backs too far into horizontal shelving causing the forklift to slide under the shelf and crush the driver. The risk of this happening is even greater than the risk overturning. In 2014, for example, a 54 year-old Omaha man who was driving a stand-up forklift died when he backed his vehicle into a shelf and pinned himself between it and the machine. Colleagues called a helicopter to take him to the hospital, but the man died at the scene. According to a report by the American Society of Mechanical Engineers (ASME), half of 3,000 accidents in a particular study involved a collision between a stand-up forklift and a stationary object. In 22 of these accidents, the operator died and 700 suffered serious injuries. This nine-second video shows what happens when a standing forklift operator backs into the horizontal crossbar of a shelving system. As you can see, this type of accident can cause serious injury or even death. To avoid under-ride accidents, you need to be aware of your surroundings at all times. Proper training also helps. CertifyMe.net has a complete selection of OSHA complaint training courses that explain all sorts of forklift driving hazards, including under-ride situations. Check out our course catalog and get started today! Under-Ride Accidents and Injuries: Is the Forklift or Operator at Fault? Under-ride hazards are one of the most serious concerns with forklift safety today. The U.S. Occupational Safety and Health Administration (OSHA) put together a safety bulletin to address specific aspects of this hazard (more on that in a minute). Like any safety issue, everyone wants to know: is the design mostly responsible, or are operators at fault for the increasing rates of under-ride accidents? It turns out, there’s a bit of blame on both ends. Forklift manufacturers say that the fault in this type of accident lies with the workplace and with the operator, not the forklift. The fact is that there are things that both the employer and the operator can do to prevent under-ride from happening. The employer can make changes to either the forklift or the workplace. You, the driver, can pay closer attention to where you are going, especially when backing up. Here’s another depressing thing about that Omaha accident: according to a friend of the deceased, he had been complaining about safety issues at the plant and, “knew something bad was going to happen.” If you are a forklift driver and spot a safety hazard at work, speak to your boss or your union rep. If they don’t fix it, report it to OSHA. OSHA recognized the mounting accidents involving standing forklifts and under-ride incidents way back in 2009, when they published a widely-read and important safety bulletin related to the subject. Operators must keep a direct line of sight, and look toward the direction of travel at all times. When moving forward, keep your eyes ahead. When backing up, look toward the rear of the forklift, or have a co-worker provide additional line of sight. OSHA standards29 CFR 1910.178(n)(1) and (n)(6) state that forklift operators should keep their vehicles under control at all times, which includes standing forklifts approaching horizontal shelves. This seems to be the main reason for under-ride accidents. Site safety supervisors should communicate all potential under-ride accident areas. These workplaces include warehouses, distribution centers, terminals and many other jobsites. 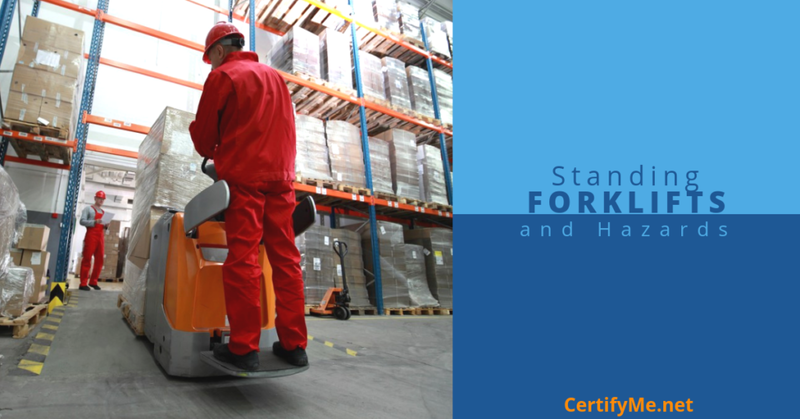 Review and assess all areas with horizontal shelves accessed by standing forklifts, and implement the required safety measures (including training) to prevent under-ride accidents from happening in the first place. An onsite safety assessment is recommended. This helps eliminate under-ride accidents and injuries. OSHA guidelines are helpful in this regard. If you’re a forklift driver and spot an obvious under-ride hazard, let your safety supervisor or immediate boss aware of the situation. Ensure all employees are OSHA compliant. Per OSHA safety rules, it is the employer’s responsibility to provide training and certification to all forklift drivers. If there are any compliance or training gaps and an under-ride accident occurs, OSHA will demand training records. OSHA’s Powered Industrial Trucks Standard, 29 CFR 1910.178, explains the complete training requirements for all forklift safety hazards, including under-ride incidents with standing forklifts. For more information about under-ride hazards and stand-up forklifts, especially how to prevent this tragic hazard, check out this OSHA Safety and Health Information Bulletin. Thanks for visiting CertifyMe.net. We look forward to helping with all of your forklift safety training and compliance needs today. Register today and ensure total workplace compliance!